Review date: 28 September 2000. Nvidia's GeForce2 MX chipset is, at the moment, an excellent choice if you're looking for a reasonably priced high performance PC graphics card. Various companies make MX-powered cards, and they're all much the same in raw specifications. The MX is a somewhat cut-down version of the GeForce2 GTS graphics processor, and it uses considerably cheaper, lower bandwidth memory. You still get 32Mb of that slower video RAM, the same amount as comes on most GeForce2 GTS cards, but you pay a lot less. An MX card gives you an impressive chunk of the performance of a more-than-$AU600 GeForce2 GTS, but at little more than half the price. If you don't have a giant monitor, this is positively all of the graphics card you need for even the most demanding PC games, at the moment. Big-name motherboard manufacturer Abit's entry in the MX market is the Siluro GF2 MX. Obviously, Abit chose this name for their line of graphics cards because they want to be associated with the Silures, a people of ancient Britain described by Tacitus as mainly occupying southern Wales. Or maybe with the Silurian period, over 400 million years ago. Or perhaps with the Silurians, one of the several menacing races of people in rubber suits who suffered embarrassing defeats whenever they clashed with Doctor Who. Oh well. It's better than companies that just give their cards numbers. I checked out the version of the Siluro MX with TV output - an S-Video, "Y/C" connector, as well as the ordinary VGA socket. In the Siluro's distinctive triangular-prism box (specially designed to drive shelf-stackers to drink) there's the card itself, three CD-ROMs and, pleasantly, a good quality two metre S-Video lead. Many video cards with TV output don't come with a cable, and S-Video leads are more expensive than the simple RCA cables you use for composite. It's nice to get one included. You also get an almost completely Chinglish-free paper manual, with a slightly confusing page numbering scheme. Um, Abit - it's OK to number Section Seven of Chapter Three as "3-7", but numbering the pages similarly, so that the 24th page of Chapter Three, on which Section 3-7 is located, is page "3-24", is just weird. Installing the Siluro is like installing any other AGP graphics card - open computer, remove old card, insert new card, restart. If you're upgrading from another Nvidia card, it's not a bad idea to manually change your video driver back to the plain 640 by 480 VGA setting at the very top of the video hardware list before you make the change. Shuffling similar cards and their drivers can occasionally cause Win95 and Win98, in particular, to give themselves atomic wedgies. Generally, though, the hardware installation process is very simple. The only annoying thing about the software setup is that Abit's auto-run menu thingy plays a large streaming video file off the CD, by default, when it runs. The video's shown on the left of the installer window, with buttons for the various things you can install down the right. If you run an installer while the movie's playing, the installer will be slow because the CD-ROM drive will have to keep flogging back and forth to keep grabbing the movie data - even if the menu thingy's in the background and you can't even see the video. This is easy enough to avoid, of course. There's a stop button, along with other playback controls, under the movie window. All you have to do is click it. ...like this. Click to see it in its full glory, and imagine it animating, none too quickly because you're in standard fallback VGA mode. Good luck finding the stop button. Experienced users will probably have autoplay disabled, of course, and just run the relevant installers manually. But I'll bet beginners find this hideous thing rather off-putting. The stock Abit drivers for the Siluro are based on the old Nvidia 5.12 version - like many manufacturers, Abit have just taken the reference drivers and added their own logos. So you can easily trade up to the more recent 6.18 drivers - download them here. These newer drivers give more speed and stability, overall, though some users have reported problems. There's nothing stopping you from going back to the older drivers if the new ones foul up on your system. You also get InterVideo's widely-bundled and more than OK WinDVD 2000 software, which lets you play DVDs on your PC, provided you've got a DVD-ROM drive. WinDVD works with the Siluro's TV out connector; you can play DVDs in full-screen mode on any TV that can accept S-Video input. 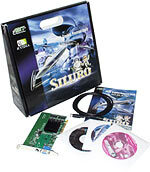 The Siluro also comes with a couple of game CDs - the giant-robot blast-up Shogo: Mobile Armor Division and the hot-car driving game Test Drive 5. Neither of these are exactly hot new titles - Test Drive 6 is out, now - but as pack-ins they're good enough. The Siluro manual tells you that you can't use the TV out and the ordinary VGA connector (the "RGB" connector) simultaneously - if you're using one, the other one's black. That's how most TV-out video cards work. But it's not, actually, how the GeForce2 MX works. Elsewhere in the manual Abit proudly reprint Nvidia's PR boilerplate about their "TwinView" technology which does, indeed, let you use both outputs at once. You can stretch your Windows desktop across a monitor and a TV, or assign particular applications (a DVD player, say) to one display or the other, or zoom part of one screen on the other - the options go on. Abit's stock drivers don't enable TwinView, but Nvidia's current reference ones certainly do. TwinView isn't, however, terribly useful on the MX cards that have come out to date. The best any of them can manage is an RGB and a TV connector - some have twin TV outs, one S-Video and one composite, but you can only use one TV out at a time. Now, it's nice to be able to put DVD playback on the TV while still keeping the PC monitor working, I suppose, but TVs are atrociously low resolution display devices. Even the very best televisions can't display clear 640 by 480 video. Since TwinView doesn't help you much with games - you can put a game on the TV, but not on the TV and on the monitor, unless you run it inelegantly in a window, with the all-important middle of the image busted up by the screen division. TwinView thus isn't useless, but it's not worth getting too excited about either. Dual-RGB-connector MX boards are just coming out now, but they're significantly more expensive. They don't need actual dual chipsets, like many older twin-output video cards, but they do need a second RAMDAC, and it isn't free. The S-Video connector on the Siluro isn't the six-pin mutant version that works with an adapter lead to give you composite video as well. It's the standard four-pin S-Video only kind, so you need an S-Video connector on your TV or VCR. And the VCR might not be up to it for DVD playback, as most DVDs command the playback system to enable Macrovision copy protection. Macrovision's whole reason for being is to stuff up the image if you try to pass the signal through a VCR. If you don't have an S-Video capable display device, you'll need an adapter to convert the signal to composite - or you'll need to buy an MX card that has composite output. It's possible to convert S-Video to composite using passive components - you just pass the chroma line through a 470 picofarad-ish capacitor and tie it to the luma line after it is passed through a 100 ohm-ish resistor. See here for information on how to do this yourself; video gear places should have converters for sale as well. The component values you need vary depending on the output signal, though, and component mismatches can result in a lousy picture. At its stock speed - 175MHz core speed, 166MHz RAM speed - the Siluro is absolutely exactly as fast as any other stock-speed MX card. Like all of the rest of the MX breed, it beats the older GeForce DDR (the best Nvidia had to offer before the GeForce2 GTS came out) at resolutions up to 1024 by 768, and then starts to drop away. At 1280 by 1024 or lower resolution, though, the MX is quite fast enough for all current games, and everything in the pipeline for the next year. Given that better than 1280 by 1024 is of little use if your monitor isn't bigger than 19 inches, and also given that DDR GeForce boards are still selling for more than $AU500, the MX is an excellent bargain. The Siluro has exactly the same 6 nanosecond (ns) Hyundai SDRAM chips as you'll find on a selection of other MX boards - like the ASUS V7100 I review here, just to name one. The 6ns speed rating ought to restrict this RAM to its 166MHz stock speed, but Hyundai memory can often run faster than its rated speed, and a hair over 200MHz is likely to be stable. Abit provide an overclocking utility, "Graphic Max", on the main driver disc. Graphic Max only works in Win95/98; if you're using Windows 2000 Professional (Windows NT is a poor choice for 3D gaming...), you'll have to find something different. Like, for instance, the generally excellent PowerStrip. Incidentally, PowerStrip also cures a problem, peculiar to Windows 2000, which makes games incapable of inheriting the refresh rate you've set for a given resolution. They run in eye-straining 60Hz mode instead. PowerStrip makes it easy to lock everything to the highest refresh rate your monitor can handle at that resolution. Fiddle with the overclocking settings and you'll very probably be able to manage better-than-200MHz settings for both core and memory with the Abit card. If you want high core speeds to be stable, though, it'd be a good idea to strap a fan onto the card's plain heat sink. Some other MX boards, like Leadtek's for instance (reviewed here), have a fan as standard, but this one doesn't. Cranking the core speed doesn't make a huge difference to the MX's performance, anyway. At lower resolutions, the MX is fast enough to deliver ludicrously high frame rates if the CPU can feed it geometry data fast enough, which it generally can't. At high resolutions, the MX's slow-ish RAM becomes the limiting factor; the RAM speed determines the card's raw pixel-painting power, and this "fill rate" is less than half of that of the full GeForce2 GTS. So it's RAM overclocking that matters most. All MX cards seem to be overclockable enough that you'll be able to get a real better-than-10% speed improvement at higher resolutions, and there's very little difference between different MX boards in this department. If one can manage 203MHz RAM speed and another can manage 214, big deal. That'll only make maybe a three per cent difference to your actual frame rate, which you will not notice. Frankly, I don't see a lot of point in overclocking MX boards, or indeed anything else Nvidia have recently released. Sub-20% speed increases - often, sub-15% - just aren't worth losing any reliability over. The MX chipset is very impressively fast at its stock clock speeds, anyway. Since all MX cards are very much the same, and since few MX cards come with any very exciting extras, people shopping for an MX card should make price their first priority. The Siluro MX is a quite new card, and as far as I know nobody here in Australia's stocking it yet. Asus V7100s, yes; Leadtek WinFast GeForce2 MXs, yes. You're looking at less than $AU370 and less than $AU325 for these two, respectively; they both have TV out, like the Siluro, and the Asus card has both S-Video and composite. The Siluro doesn't seem to be widely available in the USA yet, either. There are lots of MX cards available for less than $US130 from the online discounters, but about $US150 seems to be the going rate for the Siluro from such dealers as have it. At this price, the Siluro's not a very good deal. But it'll become more commonly available and its price will no doubt drop in the next few weeks. The current lousy value of the Australian dollar means that local video card prices are likely, in the short term, to stay steady or maybe even go up a little, so if you're shopping for a video card at the moment, you might as well buy now. If you can find the Siluro MX at a decent price, buy it. 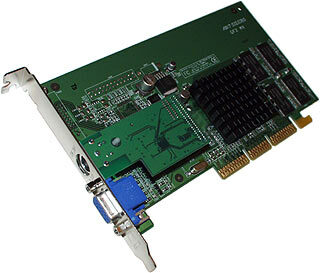 An amazing, revolutionary super-card it is not, but it's as good as any other MX card. And MX cards are great. Review Siluro GF2 MX kindly provided by Abit.